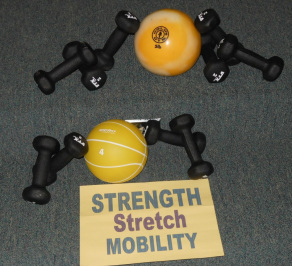 _ This is a very informal group dedicated to increasing mobility through strengthening and stretching exercises. We incorporate light weights and a chair for support into our exercise routine. Come and join us every Wednesday from 11:00 am until noon for some fun, fellowship and exercise. There is no charge and no sign up is required. This group sponsors the Pastor’s Pantry for the less fortunate. If you would like to contribute a nonperishable food item for the pantry we would appreciate it, but it is not required. Always remember to check with your physician before starting any exercise program.